A nurse prepares a flu shot at the Salvation Army in Atlanta last month. The disease is still "widespread" in many places, but slowing. The disease is "widespread" in 45 states and Puerto Rico. 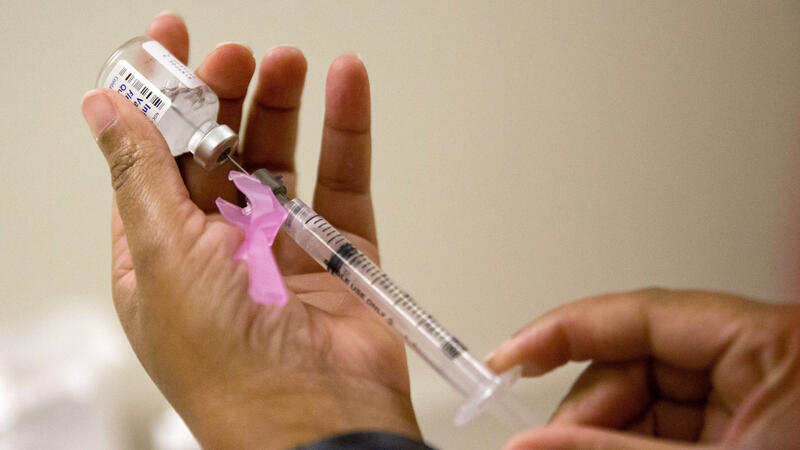 But health officials in Oregon, Minnesota, Texas, New Hampshire, Hawaii and the District of Columbia report that they're seeing only regional or local flu activity. "That's a very good sign that activity is decreasing. There still is a lot of flu out there," says Dr. Alicia Fry who works in the influenza division at the CDC. One gauge of flu activity is reports of "influenza-like illness" as a percentage of all medical visits to a particular set of medical facilities that gather this data. That figure dropped from 7.5 percent of all visits three weeks ago, to 5 percent last week. The baseline figure, in the absence of a flu outbreak, is 2.2 percent. The reports of influenza-like-illness also declined the previous week – a hopeful trend. "We could have six more weeks of flu. Now, it could be shorter. We don't know. It's really hard to predict flu, but it could be a month and a half," says Fry. Health officials noted a substantial decline in the number of tests positive for Influenza A viruses, which have been dominant this year and less likely to be blocked by the flu vaccine. Influenza B cases also declined and now appear to be responsible for about half of all illnesses in this surveillance network. Overall, 9 percent of deaths in the U.S. during the week of February 10 were caused by flu and pneumonia, the CDC reports. By that measure, flu is still considered to be at epidemic levels. This flu season is one of the most severe in recent years. Unfortunately, the vaccine was not very effective this year, and that made matters worse. Even so, health officials say it's not too late to get vaccinated. Using past seasons as a guide, flu is likely to be spreading in the weeks to come. This year's nasty flu season has finally peaked. That's according to the latest report from the Centers for Disease Control and Prevention. Even so, NPR's Richard Harris says the disease is still widespread and will be around for weeks to come. RICHARD HARRIS, BYLINE: For the second week in a row, reports of flu-related illness have declined nationwide. ALICIA FRY: Flu season has peaked, and activity has started to decrease. HARRIS: But Dr. Alicia Fry at the CDC's influenza division cautions that flu remains present throughout the nation and is widespread in 45 states. And people continue to die from the disease. The CDC tracks pediatric deaths carefully, and that tally has jumped another 17 to 114 in total for the season. Flu reports from hospitals are on the decline, but flu and flu-like illnesses are still responsible for about 5 percent of all hospital visits. The benchmark for that figure in the absence of a flu outbreak is 2.2 percent. FRY: This season was one of our more severe flu seasons. And the activity got so high that even though now we're decreasing, we're still higher than we were some earlier seasons. HARRIS: One reason this year was especially harsh is that people are more susceptible to serious illness from the main strain of the flu that circulated this year. To make matters worse, the vaccine to protect people from that strain wasn't very effective. So the flu was still making people sick and still spreading even among people who were vaccinated. The good news is that, in recent weeks, a different strain of the flu has started to dominate, and the vaccine is much more effective in preventing that from causing disease. FRY: We do recommend that people continue to get vaccinated if they haven't as long as there is flu circulating. HARRIS: And Fry says flu could be circulating for some time to come. FRY: We could have six more weeks of flu. Now it could be shorter. We don't know. It's really hard to predict flu, but it could be, you know, a month and a half. We just don't know for sure. HARRIS: And just because this flu season has peaked doesn't mean it's over. Richard Harris, NPR News.